Kasilof RV Park is the destination of choice for fishermen looking to tackle the King, Silver and Red salmon of the Kenai and Kasilof Rivers in Alaska. Trout fishing in Johnson lake is also very popular all summer long. Directions – located approximately 15 miles south of Soldotna, AK. Turn left at the Sterling Highway mile 110.1 on Johnson Lake Road (across from Central Emergency Facility). Follow the signs on Johnson Lake Road past Tustumena Lake Road to the next left, Crooked Creek Road. Drive 1/4 mile south to the entrance of Kasilof RV Park. 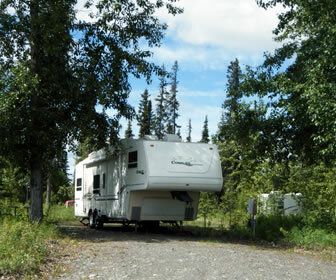 Description – Kasilof RV Park & Campground is a smaller 17 site RV park conveniently located next to Johnson Lake and just minutes from the Kasilof River. Dates of Operation – May through Sept.
Johnson Lake Campground State of Alaska campground located on Johnson Lake in Kasilof. 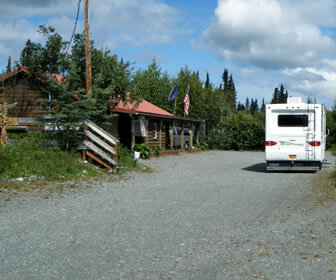 Kasilof RV Park and Campground, Kasilof AK.